For the last 1.5 year I've been working on a little personal project, heavily inspired by games I liked and wanted to see them mixed. I called it Arpago. It is a top-down action RPG-lite as I like to call it. It is set in a cartoony fantasy universe, has semi-open world divided into zones, and a lot of freedom regarding the playthroughs. Player can choose one of 3 playable races - Human, Fox Folk, or Troglodytes, and one of 5 classes - Warrior, Ranger, Marksman, Summoner, Battlemage. 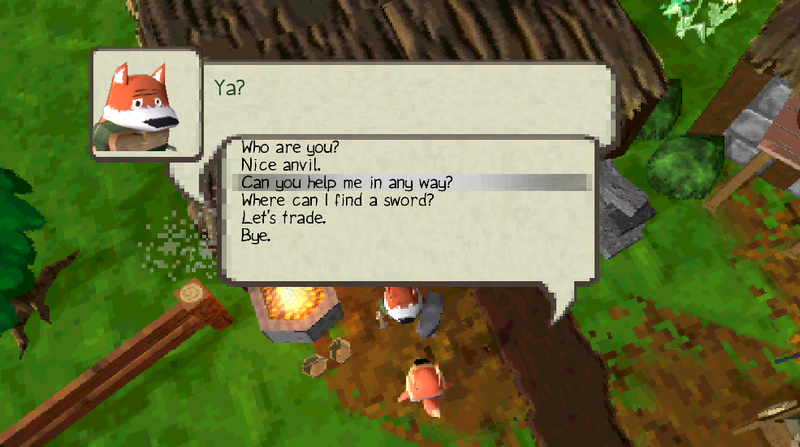 The game has working combat, inventory, spells, quests, map, NPCs, enemies, dialogue, interface, usable objects (ex. tools), split-screen, so the only things left to do regarding major features are finishing local multi and online support. Major inspirations were Egoboo- a roguelike from early 1999, which I used as a reference regarding combat dynamics, "kind-of" visual style, and perspective. Dungeon Siege - hack'n'slash / RPG from 2002 - it was my go-to inspiration regarding magic, class design, balance, as well as its dedicated huge multiplayer map was a good example of world design. Also Tibia, an MMO from 90s that I played for 4 years in mid 2000s - from it I took some lessons regarding world design, creature balance, and atmosphere. Other mostly minor inspirations probably were Gothic 1 & 2 (settlement design, Khorinis is just so good city) and Dark Souls games (trying to create a lot interconnectivity in the world, using a kind of savepoint system, still deciding on death penalty). I work on it alone in my free time, I made all the assets except sounds myself and have spent over 1500 hours on its development as of now. I have fun doing it, I don't treat it like a second job and I take long breaks occassionally. I've got a Twitter and a Website with devblog, which I try to keep updated. If you are interested in the project, please let me know! Any ideas, any criticism, any suggestions - all kinds of feedback are welcome! You filled in the entire link, but the number behind ‘v=‘ (without any spaces anywhere) would have done the trick. Quote me to see what I have done. I hope your game will be a succes, thanks for mentioning it here! Hey Eye, thanks a lot! It's difficult to edit, as I have to wait for mod's approval after every action. Not sure when the limit is lifted. After 5 postings it is lifted. Nowadays it is 7 postings. Last edited by Eye; August 31st, 2018 at 11:41. The compact mode, which is visible at the start is the panel present all the time. It consists of your current health (red bar), stamina (green bar), mana (blue bar), character level, and set of main hotkeys (configurable, but default would be numbers 1-5, Q, R, E, F, C). As you probably don't need more details while you are walking around or fighting, I think this is just right amount of information to keep the screen clean. The extended mode consists of much more info - right below the hotkey/resources bar which moves to the top, there's a second set of hotkeys - by pressing a modifier you switch hotkeys to the other set, so you can have more stuff available during combat. On the left from the second set of hotkeys you can see current experience and progress bar. In the center you can see your character and his name, and the camera automatically zooms-in when you open character sheet. The panel with item details is now located at the right side, and it has a few additions. First of all, the items can now be limited to certain classes (crossbows to ranger, swords to warrior, maces to warrior and battlemage, staves to summoner and battlemage, and so on) - configurable per-item. I don't want to be too restrictive in that regard, but that will certainly make the balancing a bit easier later on. 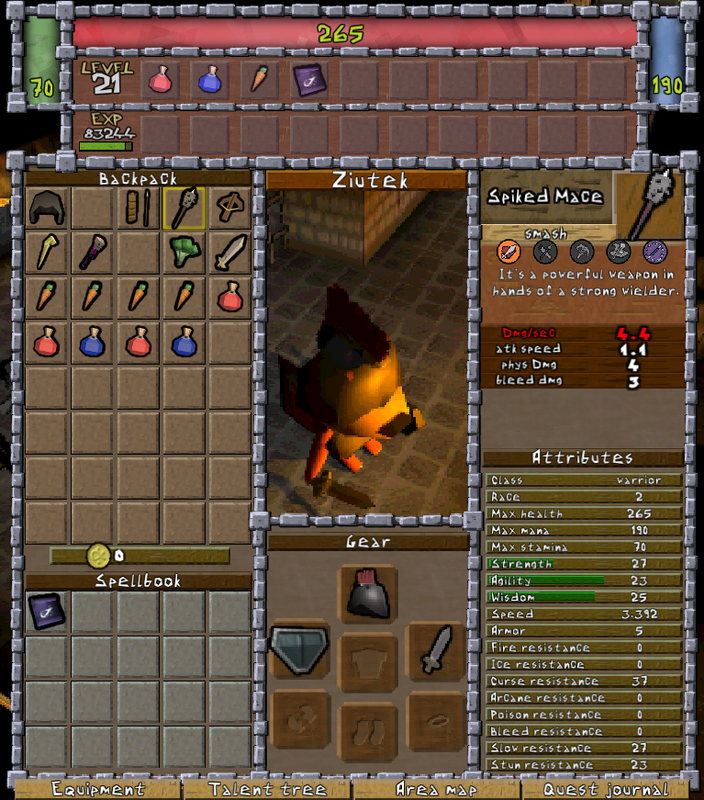 The highlighted (coloured) icons tell you which of 5 classes can use selected item. Second addition is the description panel - each item will have a description, and I'll try to make them mostly unique. Right under the item information there's Attributes panel - these are you character stats, and most are pretty self-explanatory I guess. But the logic behind them isn't so let me describe. There are 3 main stats - Strength, Agility, Wisdom. Each class has different importance of each stat - Warrior needs a lot of strength, and a bit of agility; Battlemage needs Int, but makes use of Str; Summoner is an Int class, and so on. Next attribute - Speed grows with your level and Agility, and is influenced by equipped items, active spells and debuffs. Armor relies mainly on equipped gear and buffs - better items might affect negatively your Speed most of the time. Resistances are affected by your current stats, class, items, and level - they were fine-tuned yet for obvious reasons, but Int will be useful for those seeking resistance against elements, Agi would cause stuns to be shorter, and Str should help you resist slowing effects. Below the character itself, you can see your equipment in use. It has changed not only visually. I've decideded that assigning "main weapons" to the right hand and "secondary items" to the left hand would be most beneficial - it saves a lot of time when animating characters, simplifies logic behind the attacks, and makes it easier for user to familiarize himself with interface and controls. All in all, it was removing feature bloat, as it added next to nothing, except unnecessary complexity. Clicking the item here removes it and puts it in the backpack. At the bottom-left, there's something entirely new - a Spellbook. I have completely redesigned spell system, as it was hardly intuitive, was difficult to operate, and required you to carry spell scrolls with you all the time, what would result in very low backpack space for most classes. After you loot or buy a spell, it appears as a scroll in your backpack - you can sell it, throw it away, or LEARN the spell. Learning the spell adds it to your Spellbook, as long as your class is eligible and you haven't learned the spell already. From Spellbook you can assign the spells to hotkeys, and they cannot be removed. TALENT TREE - it's a very early concept, which we haven't yet decided on - the current idea is that Str/Agi/Int progression based on successful attacks and spells will be removed, and it will all be integrated into talent tree. It will make balance easier, the characters will be much more unique, specializations will be possible, and I really like decision making after leveling up. We've got some mock-ups of talent trees, and as you might have noticed even some early icons, but it's too early to talk details - we don't plan on including anything besides very basic version of it in the demo. QUEST JOURNAL - a list of active and completed quests with details regarding it's points of interest, current stage, and a short description. The main part of the tutorial shouldn't take more than 3-4 minutes, and the initial dungeon/cave will take additional 10 minutes tops, after which you'll have the option to discover what the hell happened to you and why you are here. I also added first spritesheet-based animation, and it's the particle effect of bloodsplat. I really like it and I am going to use it more often in future! 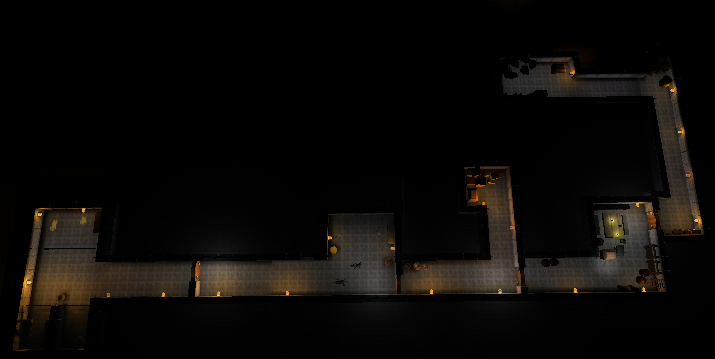 Lightmap implementation - due to major performance issues in open areas with a lot of light sources, another solution was required for lighting design. Lightmap is much easier on the performance than full-dynamic shadows (which made my GTX 1060 cry, and it should never happen). Baking light takes damn long, and isn't as easy to setup, but the effects are much better. On the image below, there are no dynamic lights at all! As Unity allows for "Mixed lighting" mode, the characters and other dynamic objects still cast shadows correctly, but it's a crazy difference of 200+ shadows on 200+ objects previously compared to 10-20 dynamic shadows on 10-20 objects currently. And it looks better! New consumables - a broccoli, a carrot, and cheese! A Goblin! Damn these repulsive creatures! If anyone's interested, I've also prepared sketches (like the ones in making of pictures) for 8 new monsters which aren't modelled yet. So our aim is to complete content for the demo - animations, finishing sound implementation, and mapping is left to do. Ok, I guess that's it. The post got longer and longer as I kept writing, I didn't plan on making it so huge, but I guess it's OK for 1.5 month of progress. Ok, less words, here's a video of the first 10 minutes with the game WITH SOUNDS AND MUSIC! And a little gif showcasing cutscene system + new dialogue "clouds"
I'd be very glad to answer any questions or have a discussion, cheers! 7. For each quest, there's one text file, so I add new file to the array with all quests. At this moment, I don't plan to add any kind of GPS or magic pointer. I prefer the approach similar to Morrowind or Gothic - NPCs tell you about the objective's location, how to get there, points of interest, and so on. 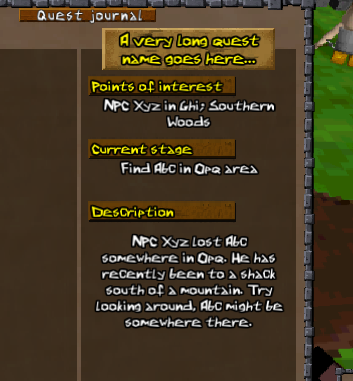 Most important stuff is available in Quest Journal, which you can see on the screenshot. I want the player to explore and get to know the world, instead of blindly following the markers using autopilot. Is this going to be a fetch quest heavy game? Well, most quests in games follow a scheme - get quest, do something in X location, come back to NPC, do something in Y location, etc. Sometimes "do something" will mean bringing an object to the NPC, sometimes it will mean removing a curse, sometimes investigating, and sometimes other stuff that I will come up with. 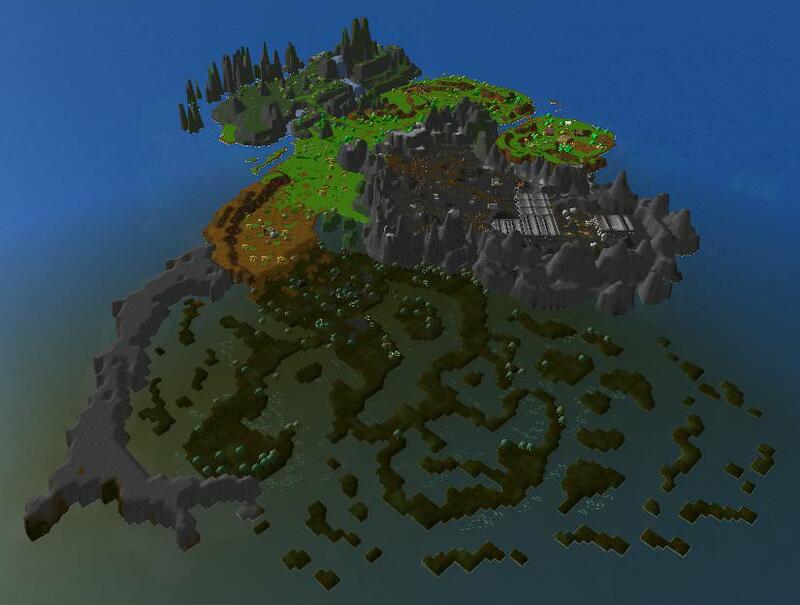 I am currently focusing on the first act, and it will have 2 possible approaches - either help 4-5 NPCs with their problems (answering your question - it often means bringing a herb or a tool from somewhere) in exchange for their assistance in leaving the island, or ignore NPCs completely and do everything yourself - find the tools, find materials, build a raft, etc. Without hints from NPCs it might be the harder way. My idea for the rest of the game relies on one large objective (which I have some ideas for, but haven't decided on yet), which you will know from the first minutes of Act 2. You might want to ask around, explore yourself, sneak somewhere, bribe people, get all information any way possible - all of those will be SIDE quests/activities, which will serve a purpose of helping you, as a player. They will give you necessary hints where to search, and you will gain valuable experience and items, which will make the main quest easier. The world will be open to you, but you might find obstacles which will prevent you from progressing certain way until you get better. To say it short: the more you skip, the more difficult it gets. It's up to you how much. Ah, very cool! It's difficult to find an open world game that doesn't hold your hand. Re-implemented weapon trails, and made them look better! …and currently I am working on dialogues and quests. 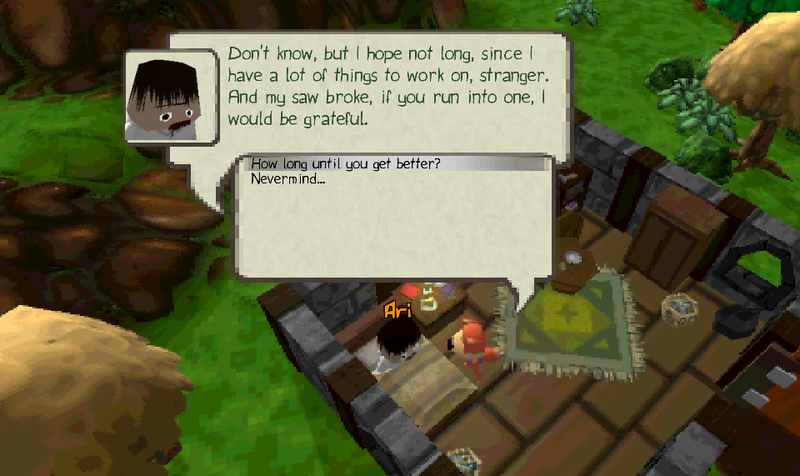 Here's a little walk around the Dagis village, and a dialogue with farmer Ferk, who's probably the first person you'll meet there.